Hi everyone! This week’s recipe is my concoction for a do-it-yourself Thai peanut butter stir-fry. I call it DIY because it’s never tastes the same twice! This recipe’s instructions are cooked in a wok, so keep that in mind if you want to cook it in a different pot. Heat 2 tablespoons of sesame oil in a wok on medium heat. Add your meat and toss frequently. (If you’re using tofu, recommend cooking it according to its instructions and then adding that last so it doesn’t get too gushy.) If your meat starts sticking to sides of pan, toss in a little bit of broth or apple cider vinegar. Once meat is fully cooked, add veggies and cover. Stir the sauce thoroughly. It will be thick, almost like the consistency of a frosting, but that’s okay. After the veggies have had the chance to cook a little bit, add the sauce and stir. There will be some juices in the wok from your cooking, but that helps spread the consistency of the sauce. The more chili paste you use, the spicier the sauce will be. If it’s too spicy, tone down with cinnamon or honey. The grains will help ease a sensitive palate; I recommend not adding the grains to the wok for that reason. Typically, I also crush peanuts and scatter them over the top. Lots of variations and different ways to make this recipe, but the sauce is pretty simple. Remember, the secret sauce is the best part but you can spice it up (or down) as needed. 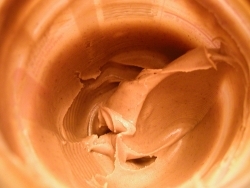 I’ve also tried this recipe with cashew and almond butter; so far, peanut butter spreads the best. If you’re sensitive to peppers, just take it down a notch and add something a little sweet to balance the spice. Hope you enjoy this spicy concoction! Are You Overestimating Your Value as a Writer? If you’re a writer and you want to get published, you often have to deal with with other people’s expectations about your work. There’s another layer of expectations, too, because you probably have personal assumptions about how you value yourself and your work. The two spheres, while similar, are very distinct. You see, when you overestimate what you’re worth, you will make certain career decisions based on those assumptions. The reverse is also true as well. Did you know that your expectations can negatively impact your relationship with others in the publishing industry as well? Rachelle Gardner, a literary agent who is very active online, shares some of the writer expectations she’s encountered and gives very direct reasons why they are not based in reality. If you aren’t clear as to whether or not your personal expectations will damage your professional reputation or sour your experiences as a writer, be sure to read Managing Expectations by Rachelle Gardner. It’s definitely worth your time. For any creative professional who is providing a service, the difference between making money now and making money over the long-term can be pretty frightening. On the one hand, we all have the tendency to make decisions based on the power of a dollar. How many jobs have we taken that we were over-qualified for? How many assignments did we take because we needed to pay a bill? Are You Providing a Service? The idea that you, as a creative professional, are providing a service goes much deeper than making those quick decisions. Let me walk you through an example of what I’m talking about. Let’s say I get hired to write a story set within the Hellboy universe. (Hah, I wish!) Because that setting is owned by Mike Mignola, I would not own the rights to what I’ve written. Since I already know the setting, I don’t need to spend a lot of time learning about Hellboy, so I wouldn’t lose a lot of time there. I would, however, need to research new stories within the setting because there’s already been a lot of myths covered. Then, there’s the time it would take to write the story and go through the editing process. Once the story was done, I can’t do anything else with it because now it belongs to someone else. Even though I wrote for a setting I love, I still produced an asset for someone other than myself. In short, I provided a service to develop something that someone already had a need for. This example highlights how writing for a tie-in property typically works. The reality of being a creative professional is that we produce content for other people in order to make a living. I look at the process of developing an asset for someone else as our ability to provide a service rather than produce a deliverable. Other examples range from writing website copy for someone else’s business to graphic design to developing a game and pitching it to a publisher. The concept, though, is pretty simple to follow once you start tracking how the money is flowing to you. If you get paid up front for the work you’re doing, I feel that it’s helpful to look at your time as a service related to product development. You are, in effect, developing and providing an asset that someone else needs and will, in turn, sell. Or Are You Creating an Asset? When you design something for other people to purchase that you have more control over, then you’re creating an asset. An example of that is an illustrator creating a clip-art CD or offering prints for sale of artwork they own the rights to. Now, there are advantages to both business models because, in many ways, an asset’s value increases depending upon how many people want that asset. I could design an interactive fairy tale for you, but if you didn’t want it, then it’s not worth anything and I’d lose money because I had just spent all that time creating something you don’t care about. The reality of developing your own assets, is that it isn’t enough “just” to create the asset. You need to figure out how you can get people to pay for it. For a writer, that means you have to develop a strong base of readers that will invest in your work. A really good example of what I’m talking about here, are some of the arguments that self-published authors make. To those that don’t understand how publishing works, the publisher is greedy because they have too much control over the author’s asset (e.g. the book). What they don’t understand, is that the publisher is providing the author with a better chance of reaching readers which makes their asset more valuable. Even though there are many services out there that offer some of the same services as a publisher does, the majority of self-published authors don’t sell thousands of copies of their work for a variety of reasons. For starters, those services are not discriminate; they do not turn down an author based on the quality of the work. Publishers do, because they understand that books are assets that represent the author, but also their brand name, too. This is why authors who go through traditional models typically sell more books simply because of the way publishing works. Now, the examples I mentioned above may not apply to you specifically, but the idea is still the same. If you think about your time as your primary asset, then consider the following questions: Do I own what I create? If so, how am I getting paid for it? If I’m not getting paid what I’m worth, then how can I get paid more? For myself, I don’t attach a “good” or “bad” value to providing a service versus offering an asset because I look at them in terms of different business models. Which is, realistically, what they are. I’d absolutely write a tie-in story for a property I’d love; on the flip side, I’d still want to write a fun story of my own, too. Not sure about what you think about my post today, but I feel this idea is pretty important. That’s part of the reason why there’s so many changes going on here behind-the-scenes that I haven’t announced yet. Deep thoughts today! Do these questions resonate with you? Why or why not? I’m not sure how many of you that read my blog know about DriveThruRPG.com or DriveThruComics.com. Did you know that DriveThruRPG.com is the world’s largest retailer for digital hobby games? I’ve contributed to a few games within the gaming industry over the years. This industry has been really fun to be a part of and I’m excited for my panels at GenCon: Indy’s 2010 Writer’s Symposium, too. The hobby games industry has been great to be involved with and has been a boon to my creativity and my professional career. The best part about gaming, though, is the people. Leanne, Shari and James, who composed the music for THE QUEEN OF CROWS trailer, are all people I met through gaming. I’m pleased to announce that our project will be included in the Christmas in July sale at DriveThruRPG.com! From now through Monday, July 26th at 6:00 p.m. EST, my e-book entitled THE QUEEN OF CROWS will be priced at $3.75! Click Here to buy THE QUEEN OF CROWS on sale now at twenty-five percent off. There are literally thousands of digital titles on sale, so if you like to game or read, now is the perfect time to check out DriveThru. The sale also applies to comics at DriveThruComics.com, so you can read comics from publishers like Top Cow, Archaia and 2000 A.D. for super cheap. Hope you get the chance to check out some other games and comics, too. Many of these people pour their sweat, blood and tears into their work because, like me, they love what they do. There’s a lot of great products on sale, so if you’re thinking about going digital, now’s the time. Slice the uncooked bacon into square pieces. Then, brown ground turkey with bacon in skillet. Add about a tablespoon of olive oil and as much garlic as you normally would. Once it’s cooked, you’ll want to drain the fat before you add anything else to your concoction. After I put the meat back in the pan, I add about a quarter cup to a half cup of red wine and stir that into the meat. I find that the wine takes that “turkey taste” edge off. Then, add your tomato sauce, some dried shallots and oregano. Let that simmer for about five minutes on low heat. If your sauce thickens too much, add a little bit of water to it to thin it out. While your sauce is simmering, fill your pasta pan with water and add a tablespoon of olive oil, a pinch of salt and some herbs. Don’t be afraid to be generous with your sprinklings here. This step is totally worth it because the taste of the herbs will infuse into the noodles while they cook, which makes a cheap pasta taste like it was created at a gourmet restaurant. Once the water is boiling, you’ll want to follow the directions on the box to ensure your pasta is cooked correctly. I usually break the spaghetti in half before I add it to the pot. Immediately after you’ve added your pasta to the water, stir your spaghetti sauce and add a sprinkle of red pepper flakes and about a tablespoon of the best maple syrup you can find to it. Then, turn your heat down on your sauce even lower. Once your pasta is done, you’re ready to eat my recipe for spaghetti with bacon. The best part about this concoction, is that there’s a number of different ways you can spice this up. I should point out, however, that if you’re going to use red meat you might want to consider adding some milk to your tomato sauce instead of maple syrup. Beef tends to have a fuller flavor and you don’t want your spaghetti sauce to taste like a bacon burger. Or maybe you do? Either way, there’s a lot of variations that you can try here. Sadly, this is not a vegetarian recipe but that doesn’t mean I won’t try a version that’s vegan-friendly. If you’re meat-free and are inspired, be sure to let me know what you’ve come up with.